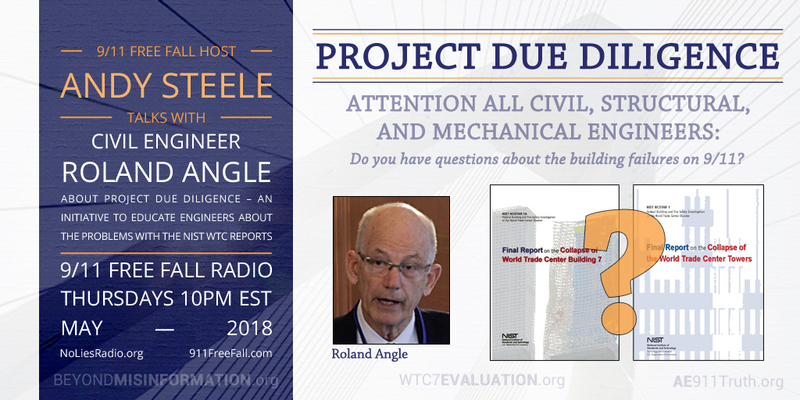 Andy Steele is joined by civil engineer and AE911Truth Board member Roland Angle to discuss Project Due Diligence—an initiative to enlighten engineers all over the nation about the glaring problems with NIST’s WTC reports. 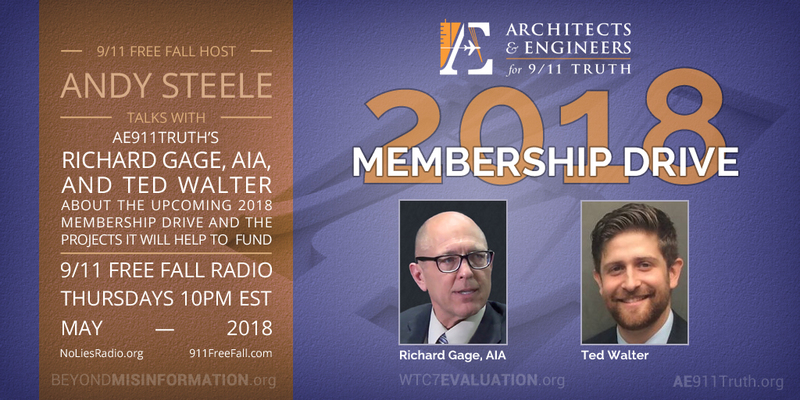 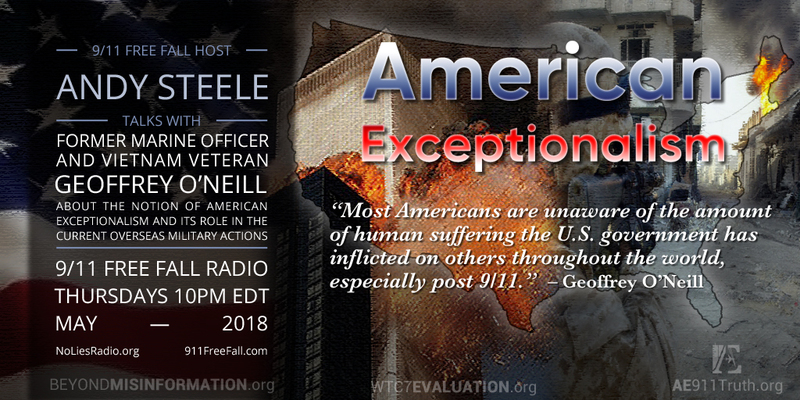 In this episode of 9/11 Free Fall, host Andy Steele is joined by Richard Gage, AIA — president and founder of Architects & Engineers for 9/11 Truth — and AE911Truth’s director of strategy and development, Ted Walter, to discuss the annual membership drive and the important projects that sustaining members of AE911Truth will be helping to fund in 2018. 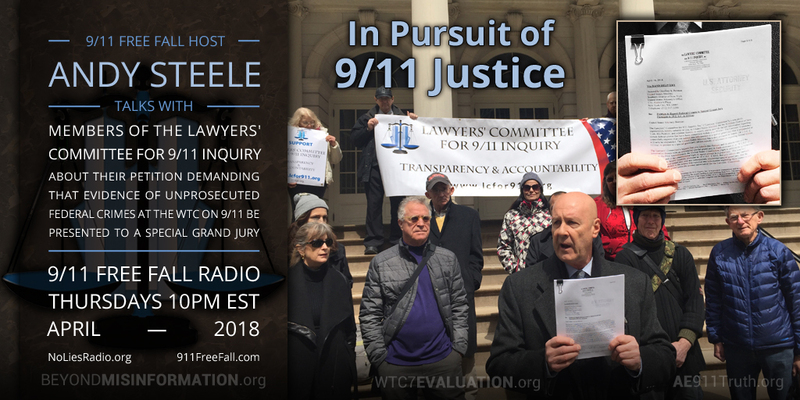 Richard also reflects on his first year of starting the organization and the challenges he faced in deciding to commit himself to AE911Truth’s important mission. 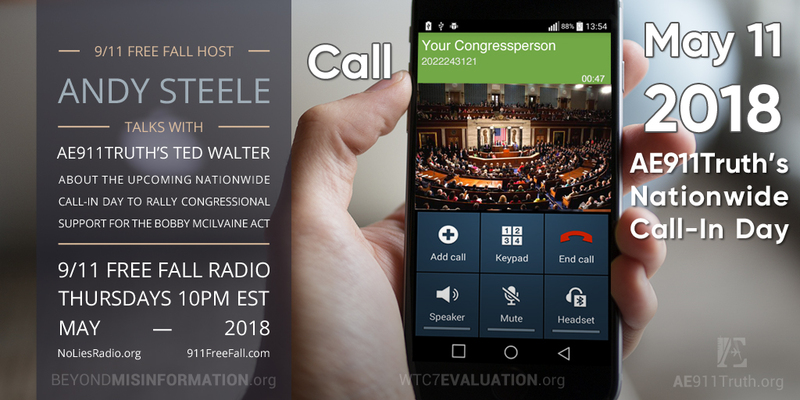 Host Andy Steele is joined by AE911Truth’s director of strategy and development, Ted Walter, to discuss the organization’s upcoming Nationwide Call-In Day, May 11th, when supporters of the Bobby McIlvaine Act will call their congressional representatives’ offices and encourage them to sponsor it. 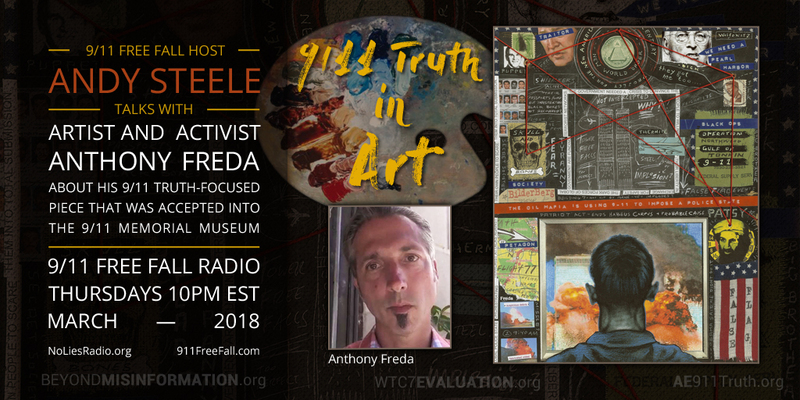 Host Andy Steele is joined by Architects & Engineers for 9/11 Truth founder and President, Richard Gage, AIA and founder and chair of The Free & Equal Elections Foundation, Christina Tobin, to talk about United We Stand– an April 29th event that seeks to spark a solution-based movement uniting students with conscious musicians, artists, and thought leaders to awaken political and cultural change. 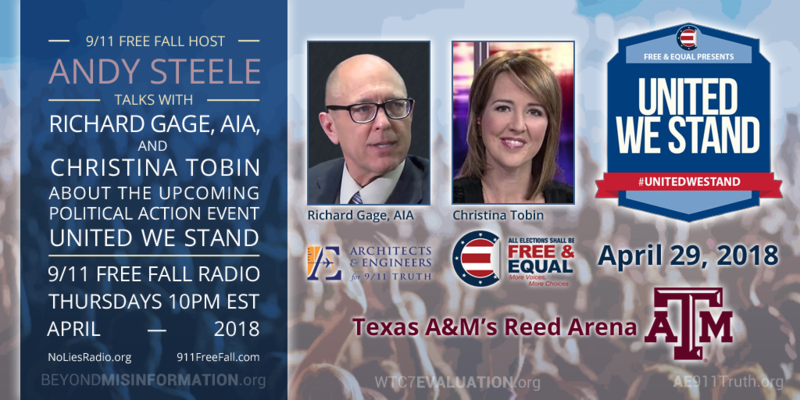 Among the speaks will be Richard Gage himself, who will be talking about the Bobby McIlvaine Act. 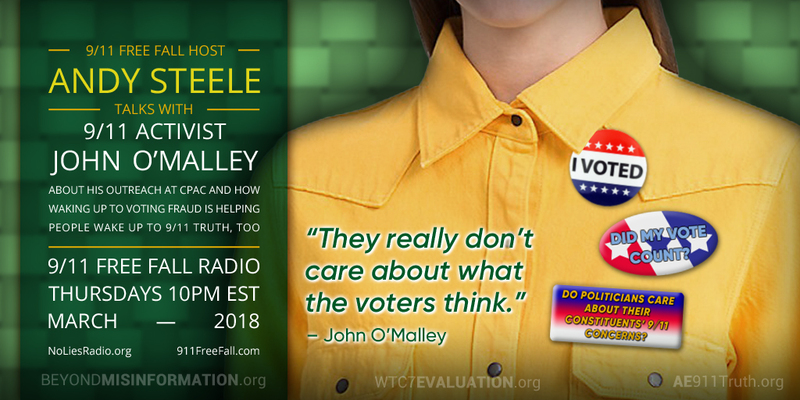 Host Andy Steele is joined by activist John O’Malley to discuss John’s outreach at the recent Conservative Political Action Conference as well as his thoughts on how corruption in the voting process impels the push for a new 9/11 investigation. 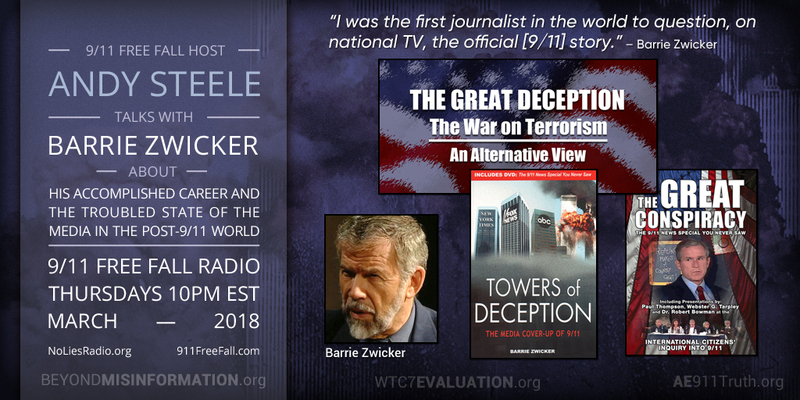 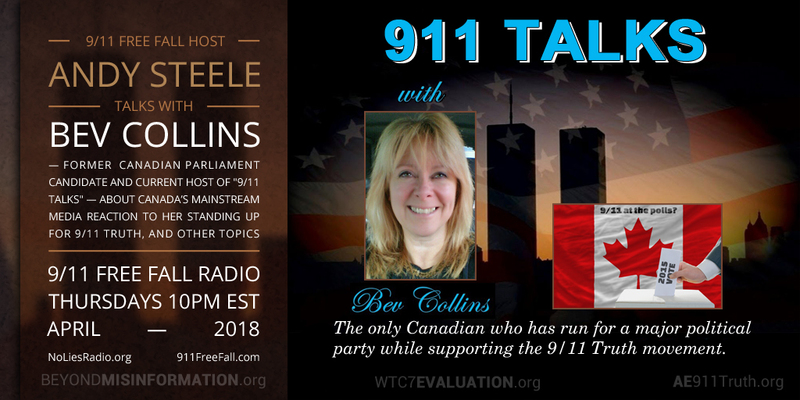 Host Andy Steele is joined by journalist, documentary producer, and political activist Barrie Zwicker to discuss Barrie’s life and the state of the media in the post 9/11 world.